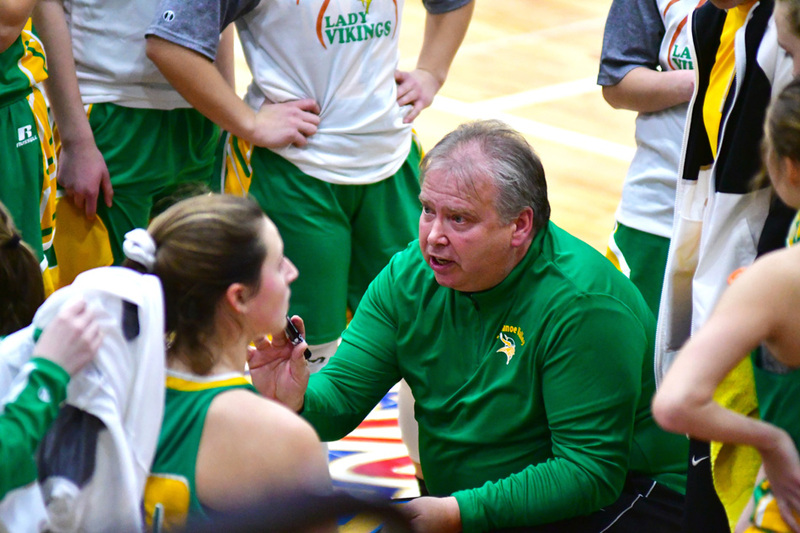 In the Three Rivers Conference matchup rescheduled from Saturday, Tippecanoe Valley stayed on course for at least a share of the TRC. Valley’s win, coupled with Northfield’s win against Whitko Monday night, put the Vikings, Norse and Manchester all in a flat-footed tie at 7-1 in the conference. Northfield faces Rochester Thursday while Valley hosts Manchester, one of those two teams will get at least a slice of the conference pie. For Valley, it has to win and then root for Rochester to win for a full claim of the title. Against the Knights in Wabash Monday night, the Vikes were all business. Valley spread a seven-point cushion after one quarter into a 13-point lead at the half at 33-20. The third quarter was separation time for Valley, using a 26-7 burst to blow the game wide open. Sophie Bussard led the way again with 20 points while Sidney Wagner had a career-high 18 points. Tippecanoe Valley (15-5) will first head to Syracuse Tuesday night to take on potential sectional opponent Wawasee. A huge second quarter by Plymouth and an equally impactful third quarter put the hosts over the brink against visiting Warriors in a make-up game from Saturday night. A 13-13 game in the first quarter saw Plymouth shoot its way to a 34-21 lead at the half. Halle Reichard was the ignition switch for Plymouth, hitting two threes in the first quarter and two more in the second. Reichard had 16 points at the half, then hit three more from deep in the third to finish with 25 points on the strength of seven three-pointers. Plymouth (15-5, 4-2 NLC) outscored Wawasee 22-4 in the third quarter. Claire Tanner hit a pair from deep and had 10 points and Alaina Clady added 11 points. Jada Carter had a hot first quarter for the Warriors, scoring nine points, but only had two the rest of the way. Casey Schroeder led Wawasee with 15 points, six rebounds and two blocks while Caitlin Wortinger added six points, eight rebounds and two steals. The JV contest had Plymouth come out on top 44-23. Lindsay Doss paced Wawasee with seven points and Becca Smith threw in six points and five rebounds. Wawasee (4-16, 0-6 NLC) host Tippecanoe Valley Tuesday night. Goshen played its cards just right and trapped NorthWood in a low-scoring affair Monday night in make-up NLC buckets. The RedHawks held NorthWood post Maddy Payne to just two field goals, both in the second half, and limited her to 10 points total. NorthWood would hit five three-pointers, three from Karlie Fielstra in leading NorthWood with 11 points. But Kenzie Bergman was limited to six points and Kate Rulli to 10 points, both three points under their season scoring averages. For the game, NorthWood was also just 6-13 from the free throw line. Brynn Shoup-Hill stepped out of the post and drilled three from deep en route to a game-high 16 points. Regan Mast also had a big game for Goshen (13-7, 3-2 NLC), scoring 14 points. Goshen won the JV contest 39-36. NorthWood (15-7, 3-3 NLC) will host Warsaw Thursday night in the final regular season game for both clubs. Wawasee’s freshman team moved to 9-4 on the season with a 10-point win over visiting Fairfield. Landon Gause led the Warriors again with 13 points and Caden Welty added 11 points, going 5-5 from the free throw line in the fourth quarter. The Warriors host Concord Wednesday night.